The Spring 2019 Town Meeting will be held beginning Monday, April 29 at 7:00 PM. Meetings are held at the Groton-Dunstable Middle School Performing Arts Center, 344 Main Street, Groton, MA 01450. The voter registration deadline for new voters for Town Meeting is 8:00 PM 20 days before the meeting. The Voter Registration Deadline is April 9, 2019 at 8:00PM for the Annual Meeting AND Annual Town Election. Note that the Annual Town Election will be held Tuesday, May 21. The Fall 2019 Annual Town Meeting is scheduled to begin on Monday, October 21. Open Town Meeting is the form of municipal government for Groton. In the Commonwealth of Massachusetts, this is the basic form of governance for most small municipalities. The town is the basic unit, and Town Meeting is the method provided by the Constitution and the State Legislature for the governance of towns. Property ownership is not a requirement for voting at Town Meeting. Renters as well as owners, if registered to vote, may attend and vote at Town Meeting. In the Open Town Meeting form of government, any registered voter may attend, speak, and vote. Attendance must be in person; there is no absentee voting in a Massachusetts Town Meeting. State law requires the town to hold at least one Town Meeting each year in the early Spring. This is an Annual Town Meeting, and the principal business of the Meeting is to appropriate money to fund the Town’s expenses for the fiscal year which commences the following July 1st. Money may be provided from “free cash” or other available funds; by borrowing; or, within limits set by the state, by appropriation directly against the municipal tax rate. The town’s tax rate is set annually through assessment of both real and personal property values. The Annual Town Meeting allows for action on other subjects also. If additional matters come up at a later time, they may become the subject of a Special Town Meeting which may be called by the Select Board or by citizen’s petition. The Warrant is the notice to the voters of matters to be considered and acted on at an Annual or Special Town Meeting. Sometimes the articles in the Warrant are quite general, and sometimes they are very detailed and specific. Town departments and officials may request the Select Board to insert articles in the Warrant during the period in which the Select Board publicly declare that the Warrant is “open”. Citizens may also petition to place articles on an “Annual Town Meeting” Warrant. Petitions require 10 signatures of registered voters for an Annual Town Meeting Warrant, 100 signatures for a Special Town Meeting. A copy of the Warrant is posted by a Constable at the Town Hall and both Post Offices as well as other public places at least 14 days before any Town Meeting. In the Warrant, the Select Board call the Meeting to convene at a certain time and place within Groton. If all the articles are not acted upon in one session, the voters present decide the date and time to which the Meeting will be adjourned to complete its business. However, the Select Board generally have suggested additional dates, reserved the facilities and made arrangements for public address systems and other aids so that Meeting usually decides to reconvene on the dates suggested by the Select Board. Groton holds two Annual Town Meetings (ATM) per year. The Spring Town Meeting is held on the last Monday in April, primarily consisting of financial articles and the budget. The Fall Town Meeting is held on the third Monday in October. The Annual Town Meetings are called to order at 7:00 PM. There is no quorum requirement for an Annual Town Meeting, which means the meeting can begin immediately no matter how many people are in attendance. Special Town Meetings (STM) may be called by the Select Board or by any other voter upon petition to the Select Board. A petition to call a Special Town Meeting requires 200 signatures. A petition to add an article to the Warrant of a STM which has already been scheduled requires 100 signatures, if the Warrant is still “open”. All signatures must be certified by the Town Clerk to verify that the signers are registered voters in the Town. Special Town Meetings called by petition usually reflect the specific need of a group or committee, however, once the Warrant is opened, other articles may be added. The Select Board must call the Special Town Meeting for a date no later than 45 days after a petition is filed, and the Warrant must be posted at least two weeks prior to the scheduled date. There is a quorum requirement at Special Town Meetings; before the Meeting may begin, 2% of the registered voters must be in attendance. 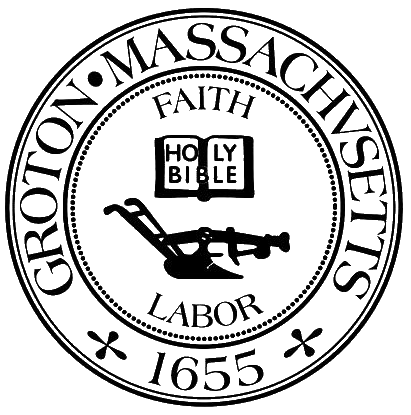 Groton’s Town Meeting is a blend of tradition and rules established in the book Town Meeting Time, a handbook of parliamentary law prepared under the auspices of the Massachusetts Moderators Association. This guide is simpler and easier to understand than the more widely known and consulted Robert’s Rules of Order. Both books are available for reference at the Groton Public Library. Town Meeting in Groton is held in the Groton-Dunstable Middle School Auditorium located on Main Street (Route 119) unless otherwise posted. Town Meeting is conducted by the Moderator, an elected position with a term of three years. The Moderator serves as the presiding officer, regulating the proceedings, deciding all questions of order and making public declaration of all votes. The Moderator’s goal is to conduct the Town Meeting in a fair, yet expeditious manner, allowing all points of view a fair hearing while still keeping the process moving. The current Moderator is Jason Kauppi. Mr. Kauppi can be reached at (978) 732-8671 or moderator@townofgroton.org. The Warrant is the official agenda for the Annual Town Meeting. It is mailed to each resident, and the voter should bring it to the Meeting, as extra copies are limited. The Annual Town Report and other informational material of importance to the Meeting are available in the lobby outside the Auditorium as well as in the Town Clerk’s office in Town Hall. The Town Report contains much information about Groton, including the names of all elected and appointed officials, their reports for the preceding year, minutes of the previous year’s Town Meetings, and financial data about the Town contained in the Town Accountant and Treasurer’s Reports. The printed Warrant contains all the articles for consideration, together with such recommendations to the Town as were available from the Finance Committee and the Select Board. The voter needs the Finance Committee Report and the handouts since the Moderator generally refers to article by subject matter only, and frequently will not read the full text of motions to be made under the articles, but may refer instead to the Warrant. The Finance Committee holds a public hearing on the budget and financial articles and makes a Report available before the Town Meeting. Notice of the public hearing is published in the local newspaper. Articles are usually considered in the order in which they appear in the Warrant. The Select Board determine the order in which articles are placed on the Warrant, taking into consideration appropriateness of subject matter, the need for professional support personnel (such as engineering consultants) to be present and other relevant interests. Articles dealing with similar subject matter are often grouped together: financial, school, planning and zoning, etc. Citizen’s petitions are generally placed at the end of the Warrant. There are occasions when common sense or expediency dictates that articles should be considered in a different order from that in the Warrant, and the Meeting has the power to change the order. If the desired change is to defer consideration of an article, it may be accomplished by a “motion to postpone action” until after a specified article. If the desired change is advancement of a later article, it may be presented as a main motion if, and only if, no other business is pending. Votes to change the order of consideration normally require majority vote for passage, but if the motion is mere jockeying for position, the Moderator may, under his power to regulate the proceedings, require a two-thirds vote. A motion “to postpone indefinitely” effectively kills action on an article. To vote effectively at Town Meeting requires both understanding the issues and understanding the wording of the motion on which one is voting. An article (as printed in the Warrant and Finance Committee Report) describes the subject under discussion, while a motion made under the article describes the specific action on which one is voting. In some cases, the action is fully and accurately described by the article, and the motion may simply be “to take affirmative action under article ___.” Motions must be seconded before discussion may begin or a vote is taken. At the Groton ATM, motions for each article have recently been made and seconded by the Select Board. A presentation of the article may then be made by the group or groups submitting the article for consideration. Frequently, it happens that the wording of a motion differs from the wording of an article. The wording of the article must be settled prior to the close of the Warrant. The Moderator will not allow any expansion of the intent of the article since the voters must be properly warned in advance of actions they will be asked to approve. Great efforts are made to have the wording of motions in hand a few days before ATM in order to permit review by the Moderator and Town Counsel. When speaking on a motion, a voter should go to one of the microphones located at the front or in the center aisle of the auditorium and give name and address and committee association (if speaking on behalf of a committee). All remarks and questions should be addressed to the Moderator. When it is apparent that several people wish to be heard, lining up expedites the proceedings. In recognizing persons who wish to speak, the Moderator gives preference to those who have not already spoken on the article currently under discussion. Within the general framework of parliamentary procedures, the goal of the Moderator is basic fairness in the consideration of issues before the ATM. This does not mean that everyone who wishes to speak will be heard: when the Meeting decides that it has heard enough discussion and is ready to vote, a motion may be made from the floor to “move the question”. Such a motion suppresses debate and must be voted on immediately. The Moderator will not hear a motion to move the question if it is presented at the end of a statement or opinion. If a voter wishes to change a motion in some fashion, the procedure is to amend the motion. All motions to amend must be in writing and must state exactly how the voter wishes to change the motion. That way, the Moderator can know exactly what it is the voter wants to do before ruling on the motion or putting it to a vote. A voter who wishes to amend a main motion must have the amendment in writing and available to hand to the Moderator before rising to offer the amendment. The Moderator may refuse to put to the Meeting an amendment which is not immediately available in writing – The Moderator also will rule out of order any motion to amend which changes the original motion so drastically that, in the Moderator’s opinion, the motion is no longer within the “four corners” of the article. An amendment may consist of adding, deleting, or substituting words in the motion. It may take the form of a “motion to substitute” a different motion. Sometimes a speaker tries to amend “the article”, but this is improper language. It is the motion on the floor, not the article on the Warrant, that is to be amended. A motion to amend requires only a majority vote, even though the motion to be amended may require two-thirds or more for final passage. A majority vote is required for passage of a motion unless otherwise specified. Most votes are voice votes, the results determined by the Moderator. Any seven voters may challenge the ruling of the chair on a voice vote. The Moderator will then call for a standing vote. This action must be taken immediately after the Moderator declares the vote result. A standing vote simply means a visual counting of “yes” or “no” votes by raised hands. These votes are counted by Tellers, registered voters in attendance who com forward and are sworn in by the Town Clerk to count the vote. Some motions require a two-thirds vote for passage. Included in this category are votes which authorize borrowing, property transfers, and zoning bylaw changes. A few motions require even higher levels of affirmative vote for passage. A motion to reconsider requires a second, may not interrupt a speaker, is debatable to the same extent as the motion being reconsidered, and requires a majority vote irrespective of the size of vote required for passage of the motion to be considered. Local, State, National elections. To decide of express the sense of the Meeting on certain major issues before the Town. Funding for expenditures approved at Annual or Special Town Meeting that go beyond the levy limit; these require an override, a capital outlay exclusion, or a debt exclusion.The levy limit is a restriction on the amount of property tax a community may levy. Under state law (Proposition 2 1/2), a community may not increase taxes more that 2 1/2% over the previous year’s levy (plus the value of any new growth that has occurred in the Town) and may not levy more than 2 1/2% of the total full and fair cash value of all taxable real and personal property in the community. An override asks the town to approve a permanent increase in the levy limit of a community. A capital outlay exclusion asks the town to approve a temporary increase over the levy limit to raise funds for the cost of a specific capital project. A debt exclusion asks the town to add to the levy limit an amount equal to the annual debt service for a specific capital project; the increase continues only for the life of the debt. Citizens who organize to influence the outcome of a ballot vote must register with the Town Clerk, account for any money they raise, and file reports according to rules established by the State Office of Campaign and Political Finance. Groton’s Annual Town Election is held on the fourth Tuesday following the first session of the Spring Town Meeting, and is considered part of the meeting. This usually falls in the third week of May. The Election is called on the same warrant as the Spring Town Meeting. All multiple member elected offices have an open seat at each election. Questions to the voters will also appear on the town ballot as required. Groton belongs to two Regional School Districts: the two-town Groton-Dunstable Regional School District and the seven-town Nashoba Valley Technical High School District (Chelmsford, Groton, Littleton, Pepperell, Shirley, Townsend, and Westford). School assessments are part of the annual budget and are voted upon by the Town Meeting in the towns that make up the District. If the results of the votes in the towns differ, the question is returned to the town voting “no”; a second “no” vote in that town requires a joint meeting of the towns unless the difference is otherwise resolved.Override and debt exclusion questions for the school districts are also decided by ballot vote. Borrowing for the schools is approved when two-thirds of the District School Committee members vote to incur the debt. Once the District School Committee votes to incur debt, the towns must act within 60 days to approve or disapprove. Approval is automatic if no action is taken by the towns. The ballot vote to authorize a debt exclusion question may be held either before or after the Town Meeting at which the borrowing article is considered. The Town Meeting vote appropriates the money; the ballot vote approves the debt exclusion or override. For local elections, the ballot vote is held on the third Monday following the beginning of the Spring ATM. The polling center is open from 7 AM to 8 PM. Residents may register to vote at the Town Clerk’s office in Town Hall in Groton or at any other place designated by State law. You may vote only in the town you choose as your official place of residence. Voters must be registered to vote for Annual Town Meetings the 20th day before the meeting and 10 days before a Special Town Meeting. To vote in a special election, voters must be registered 20 days before the election. On the last day, the registrars of voters must hold a registration session lasting at least from 9 AM to 8 PM. Once registered, you are always registered unless you move to another town. However, failure to respond to the Census could cause you name to be placed on the inactive voting list by requirement of the office of Secretary of State. Special registration dates are announced by the Town Clerk. The tables in the lobby are reserved for material voters will need for the Meeting, such as copies of motions, the Finance Committee Report, the Warrant, and similar materials. Within the limits of available space, persons wishing to distribute materials relating to matters to be considered at the Meeting may place copies on the tables. People wishing to distribute information usually contact the Select Board’s office first. Sufficient copies must be provided for all voters who attend the Meeting. Individual distribution of materials, signing of petitions, and similar activities must be done outside the lobby space, in order to permit orderly check-in of voters and efficient distribution of materials needed for the Meeting. In addition to Town Meeting, Groton’s municipal government is made up of almost a hundred officials and committees, of which approximately 75 are appointed by the Select Board. A few positions are appointed by the Moderator. Together, these officials conduct the business of the Town on a day-to-day basis, providing administrative, public health and safety, financial, utility, recreation, and other services. Directory of Town Officials and Committees Committee Handbook Town Report (printed annually)These materials are available at the Town Clerk’s office in Town Hall. ATM and STM are taped either for live broadcast on local Groton access cable channel 17 or for delayed viewing. Refreshments are made available at Town Meetings by various civic groups in town as a fundraising event for that group. Those interested in providing refreshments should contact the Select Board’s office prior to a Town Meeting.